I was unaware such a thing exist till last month when I heard it from one of my friend. Tried it. It came out great. Fry the Vermicilli in dry tava for few minutes till the aroma comes /colour changes. Keep aside. Add a spoon of oil in tava, temper the masala ingredients. Fry onions, Add the cut vegetables, add 1/2 cup of water and keep them covered to cook in low flame. Once cooked, add the 1/2 cup of milk, add salt, let it boil. When the whole mixture is boiling hot, (you may choose to taste this water and add salt as required) add the vermicilli little by little parallely mixing them so as not to form any lumps. Add a spoon of ghee. Once boiled , Switch off and keep covered for sometime. Fry the Vermicilli in dry tava for few minutes till the aroma comes /color changes. Keep aside. Add a spoon of oil in tava, temper the ingredients, fry onions, add 1 glass of water, add salt. When the water is boiling hot, (you may choose to taste this water and add salt as required) add the vermicilli little by little parallely mixing them so as not to form any lumps. Here again, amount of water required can be estimated in one or two trials. Add 1:1 of water for the vermicilli. Keep some boiling water parallely and add them as required. Fry the rava in dry tava for few minutes till the aroma comes /colour changes. Keep aside. Add a spoon of oil in tava, temper the ingredients, fry onions, add 2 glasses of water, add salt. When the water is boiling hot, (you may choose to taste this water and add salt as required) add the fried rava little by little parallely mixing them so as not to form any lumps. The amount of water required for rava varies with each brand. It can be known in one or two trials. Unfortunately the brand I grabbed from the Indian grocery is not so good. I need atleast 4-5 glasses of water for 1 cup of rava. This could be made as Vegetable upma too. Add the vegetables like carrot/beans/cabbage.Add the cut vegetables after tempering, fry them a little, add water and let it boil. Once boiled, add the rava and proceed the same way. No big deal about making a fry curry I know, still there are little things one can follow to make it better. -Always use a WIDE pan. This helps spreading the vegetables into SINGLE LAYER and helps quick and nice frying. -Dont keep sauteing the vegetables, leave them undisturbed and saute every 5 mins. - Its not always possible to cut the vegetables evenly, there are chances few may bigger pieces and few smaller and the difference in shape makes the cooking un-even. While frying, always try to pull thin pieces towards the corners and the bigger pieces towards the centre of the tava where heat is more and fry them for some time. This way we avoid thin pieces getting over-burnt and bigger pieces getting cooked. This way you can add little oil towards center and no need to drizzle oil all over again and again. -Add chilli powder towards the end and cook for few mins and switch off else you ll end up sneezing till the fry is done. -Rather than adding chilli powder totally, add half sambar powder and half chilli powder. The spices in the sambar powder gives a good taste to the curries. Wash the rice and dal well and pressure cook it with extra water to become little mushy. In a pan, heat 1 cup of water and add the grated jaggery. When it boils well, add the rice-dal mixture into it and mix well. Kindle till the whole mixture becomes semi solid. Do not let the pongal solidify too much as anyway it will become so when it is cooled. Wash the rice and dal well. Add 2 spoons of cumin 1 spoon of pepper and cook the mixture just as u cook rice. But make sure you add extra water so that pongal comes out little mushy. Once cooked, immediately add salt and mash the whole pongal well. It mashes well when its hot. Fry the crushed pepper and cashews in a spoon of ghee and add it to hot pongal. Ghee added more will enhance the taste. If not whole pepper, use pepper powder. But whole pepper will not be very hot so can be more. If pepper powder is used, add less initially, check taste and add later if required. Adai used to be a rare delicacy at home and hence special too. We had a drumstick tree at our home so mom always makes yummy drumstick leaves adai. (Roughly the 1 cup of rice should equal 1 cup of dal's put together. Urad dal should be less. Take the Rice and Dal's in a vessel, wash well and soak them at least for one hour. Add the red chillis, ginger, hing and grind them together to a coarse thick batter. Add salt, chopped onions / drumstick leaves to the batter. Heat the tava well, pour 1 full laddle of batter on to the hot tava, level them like dosa and make a small hole in the centre. Once finely boiled, turn on to other side and boil. Rasmalai is basically the Ras + Malai. 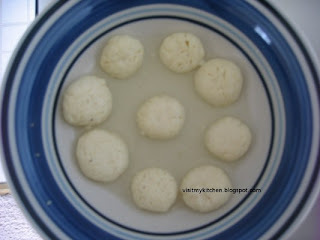 Ras is the liquid and malai is the round patties that we soak inside the ras. For malai, refer the recipe for rasagulla. Make the rasagulla and instead of making them as round balls, press the balls slightly and pat it round (like pedas) and pressure them in the sugar water. Once done, squeeze the malai gently to dry out excess sugar water and set this aside. - Boil the milk in a hard bottomed pan. Boil it well till the quiantity becomes 1/4th of the original milk content. 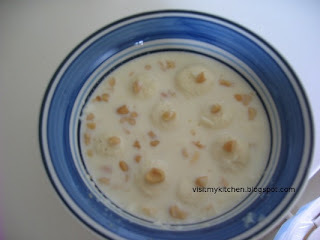 Slip the malai's into the boiling milk and let it boil along with the milk for about 10 minutes to obsorb the milk. Add saffron powder, cardomom powder and decorate it with cashews , pistas , almonds. Boil the milk on a medium flame. Switch off the heat immediately. Use a muslin cloth/ filter / any thin cloth to filter off this malai part of the milk. Sprinkle / splash some cold water on the malai to stop the Milk-breaking process completely. Let the malai to dry up fully in the muslin cloth/filter for about 30 mins. It should become fully dry without any liquid. Meantime, In a pressure pan, heat 4 cups of water adding 2 cups of sugar into it. Let the sugar boil completely. Knead the malai very finely using your hand. Make few balls out of this malai. Add the malai balls into the boiling sugar water and keep it for one whistle (if you are using a normal pan, you can keep for about 15-20 mins). 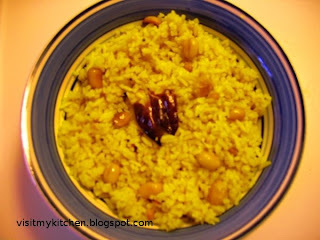 - In a wide tava, add 2 spoons of ghee and fry the Cashews / Almonds/ Raisins.Set aside. - Add the finely grated carrots and fry for few minutes. - Add the milk and boil the mixture till the milk evaporates. - In about 15- 20 minutes the milk will be evaporated completely and the carrot will be nicely boiled. - Add the sugar and mix well for few minutes. - Switch off and remove when the solid consistency is reached. - Add cardamom powder and mix well. (To get the best taste of cardamom, always add it towards the end). Use the grater which grates carrot into bigger pieces. This way, the halwa comes too good. Look at mine :) Mine was a thin grater and hence the carrot gets mashed up in the boiling process. Can use Khoa or condensed milk for enhanced taste. Some say even Soy Milk will enhance the taste. I haven't tried it yet. Can do the same with Beetroot too. Per my opinion, beetroot will taste much good. -Wash well and Soak the Rice,Methi,Poha in 4 cup water and let it set for a minimum of 4-6 hours. for 1 hour. Grind the Urad dal adding water little by little. (OR) - Wash well and soak the Urad dal with just enough water and keep it in fridge. After one hour, grind it to paste adding very water little by little. -Grind Rice , add Methi, poha and grind to paste. -Mix them in a vessel. -Beat the dough well, using hand (using hand helps in fermentation). -Let it ferment for atleast 12 - 16 hrs in a warm place. -Use eversilver vessel which is best for fermenting. Non-stick or porcelein will not be good for fermenting. -Once fermented, the dough would have fluffied up well. Mix well till bottom and pour in idli plates and steam for 10-12 mins. -Once its switched off, set it for 5 mins and take out idlis using wet spoon. Pressure Cook the Tur dal. Extract pulp of tamarind adding about 1 cup water. Boil it adding hing for about 6-8 mins. Add the ground paste,salt to it and boil further for couple of minutes. Add the cooked tur dal and boil for further few minutes. Temper with mustard and curry leaves. Once you have cooked rice ready, this dish could be made in 10 mins flat. Make thick pulp out of tamarind. In little oil, fry mustard, once it splutters add gram dal,cashews, Groundnuts and fry for a minute or till brown. Add tamarind pulp,simmer, once it comes to a boil switch off. Add this to rice, add salt and pour few spoons of oil and mix thoroughly. --This tastes best when it sets for few hours. --We love adding lot of turmeric that makes it more yellow, one can reduce the turmeric if its not prefered. This could be made with any type of Greens. I made it with Spinach today. Wash well. Chop fine and pressure cook the green for one whistle or till cooked. Remove. Mash it well while it is hot. Add salt and bring to boil in a saucepan. Temper mustard, hing, red chilli and add.